It’s been more than two years since Hurricane Sandy screamed through New York City in October 2012, devastating sections of the city. Superstorm Sandy, the second costliest hurricane in U.S. history, caused $65 billion in damages, destroying 305,000 NYC housing units and leaving 117 dead. The metropolis is now working to fortify its infrastructure against future storms because, despite the 2012 devastation, a subsequent report ominously suggested that Sandy was not “The Big One” and another truly devastating storm would follow in the future. So, when will the big hurricane hit New York? New York’s “Big One” — the hurricane equivalent to shaky Los Angeles’ hypothetical massive earthquake — is, like L.A.’s version, purely speculative. But its theoretical nature doesn’t prevent researchers and scientists from ruminating on the question. And experts suggest that NYC may, indeed, be in for an even more extreme weather event. 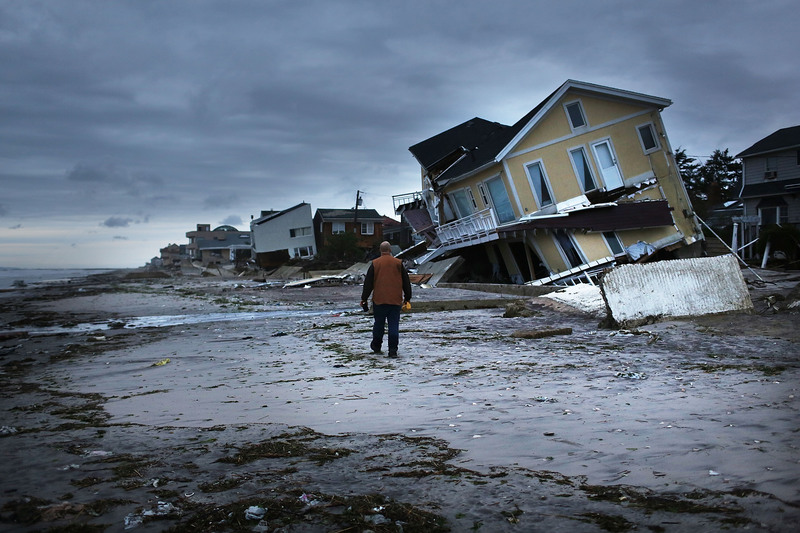 Nicholas K. Coch, a professor of coastal geology at Queens College, had been predicting for years prior to Sandy that the city could be destroyed by a major hurricane. But his warnings over an impending Big One fell on deaf ears. “People laughed at me,” the self-described “forensic hurricanologist,” told Grist in 2013. “They just thought that was the funniest thing they ever heard.” His impression, post-Sandy, is that 2012’s storm was just a primer for the extreme weather event to come. “Sandy was not the Big One,” Coch told Grist. “Sandy was a freak, caused by an extremely rare confluence of events.” Besides, Sandy had been demoted to a post-tropical cyclone by the time it made landfall on the east coast. At some stage in the future, Coch predicts, a major hurricane will travel up the east coast, barreling into New York. A New York Times article on storm-proofing efforts in NYC published last year reported that projects were being undertaken on the assumption that the city “can no longer keep the sea at bay, but must by necessity invite it in.” Stone reinforcements on Coney Island Creek and parks as buffer zones join more innovative plans for submersible infrastructure. Yet despite the litany of proposals and projects that report describes, by November 2014 less than a quarter of the $50 billion pledged by Congress to post-Sandy resilience work had been paid out. At that time, two years after Sandy, Columbia University climate scientist Klaus Jacob told The Guardian that if a Sandy-esque storm hit tomorrow, the outcome would be basically the same (although other reports suggest that the storm-proofing projects already completed would mitigate some of the damage). Mayor Michael Bloomberg, after all, set 257 projects in the works in 2013, for completion within a decade. Beaches in the Rockaways have already been reinforced, while Con Ed has committed to flood-proof its equipment. And yet, the next storm is unlikely to be precisely the same magnitude. Scientists have reached a consensus that climate change is super-charging storms, and suggest that 35 percent of Sandy’s rainfall was a result of climate change. Of course, hurricanes are also affected by other factors — including natural climate cycles. The 2014 hurricane season, for example, was mellowed out by an emergent El Niño (which Climate Central describes as a periodically-occurring pattern of unusually warm water across the surface of the eastern equatorial Pacific, which tends to stabilize the atmosphere over the tropical Atlantic Ocean). By contrast, the 2012 hurricane season when Sandy hit was predicted to be a more regular season, with nine to 15 tropical storms. Four to eight of those storms, the National Oceanic and Atmospheric Administration suggested, could mature into hurricanes, while one in three could become major hurricanes. But even with that modeling, Sandy was unexpected. Forecasters expected the storm to divert off into the North Atlantic. Instead, as Coch explains, the storm took an unexpected route after a "blocking ridge" pushed the storm west into the city. The big question remains: when will the next Superstorm hit NYC? A 2013 report from WNYC, New York's public radio, emphasized that the answer was still unknown, despite the received wisdom about once-a-century floods in the city. In water-bound NYC, certain areas are demarcated as "100-year-flood zones," areas estimated to have a 1 percent chance of flooding each year. But Sandy eclipsed those areas, with much greater flooding than expected. Timothy M. Hall, a Columbia professor, told WNYC that a storm with a similar trajectory has a 0.14 chance of hitting New Jersey on any given year (or a one in 700 years chance). An MIT/Princeton team researching the likelihood of a Sandy-type storm-surge got similar findings: one in 800 years. The weather is an unruly creature and not inclined to broadcast its next moves. In 2013, a New York magazine article on storm-preparedness kicked off with that assumption. “It's impossible to know if New York will find itself staring down another major storm this summer,” the article read. But what you can’t know for sure, you can surmise from historical patterns. NYC has a long and tumultuous history with hurricanes, and — if Coch and company are correct — future storms will no doubt be even wilder. New York’s Big One, it seems, is not an “if,” but a “when,” and the when is murky.